The Rolex Daytona watch is the most famous chronograph timepiece, from its connection to the Daytona 500 racetrack to the famed Paul Newman watches. In fact, it’s no wonder that they’ve named this watch after the famous racetrack. It’s a Rolex story that will undoubtedly continue to write its own history for many more decades to come. And, now you can experience the luxury of owning a mens Rolex Daytona watch, but at a used Rolex Daytona price. 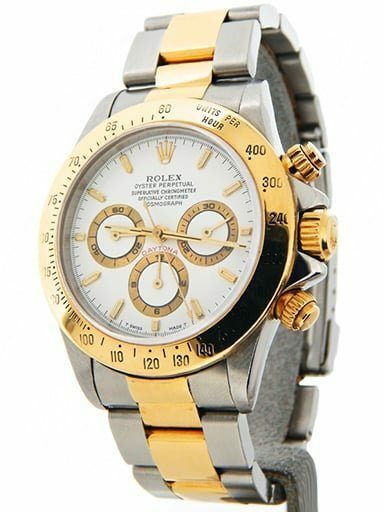 The type of Daytona watches we inventory have been in two tone, rose gold, and yellow gold.  Also, we offer 30-day money-back guarantee, free U. S. shipping, and available financing. In addition, we provide personalized customer service. So, Let us help you find that perfect fit. The first woman to win a Sprint Cup pole position at the Daytona 500, Danica Patrick, brought alot of eyes to the event. The Rolex Daytona and racing go hand in hand. It’s no wonder that the watch is named after the famed racetrack. For this reason, the Rolex Daytona chronograph is one of the world’s most copied watches. This is because of Rolex’s attention to detail, the watch’s functionality, and its timeless balanced look. Since 1937, Rolex attempted to ‘stop time’ when they introduced their ‘Oyster Chronographe’. Essentially, this watch had two pushers and two subdials to count elapsed minutes and hours. Rolex did not invent the chronograph. In fact, it was late in the game as other watch companies had other chronographs in production. Like other companies at the time, Rolex utilized a Valjoux movement rather than developing an in-house movement. Rolex rested with this decision for over 50 years. Finally, in 2000 Rolex developed their own chronograph movement in-house. Still to this day, the Daytona chronograph has a top pusher to start and stop the stopwatch and the second pusher to reset and no date function. The Rolex Daytona did not get its Daytona moniker until the mid-1960. It was then when the tachymeter scale moved from the watch dial, to an outside bezel. They used the tachymeter bezel to measure the speed of a vehicle between static 1 mile or 1 kilometer posts. The late 1960’s also saw a variety of exotic dials. This included the famous Paul Newman dial seen in the film “Winning.” Rolex produced the Paul Newman art deco style dial in short quantities in 1970. 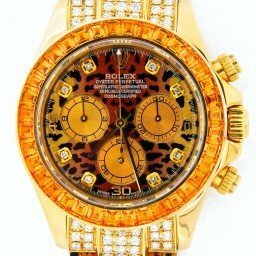 Others frequently copied and inserted these in genuine and fake Daytona watches to increase their value. The modern Rolex Daytona has three subdials for measuring elapsed seconds, minutes, and hours, and has screw down pushers introduced in the 1960 to insure water resistance when using the chrono functions under water. Until 2000, Rolex utilized either a Valjoux or a Zenith chronograph movement. The watch case used in the late 1990’s with a Zenith movement and the Rolex’s in-house movement is virtually identical. An easy way to tell the difference between a Zenith and an in-house movement is to look at the subdials. The subdials on the Zenith movement are in the same plane as the winding crown and hours/minutes pinion. The Rolex in-house movement has subdials that are slightly higher than the winding crown. Additionally, Rolex sold the modern all-stainless Daytona at a premium because of their rarity. Because of Rolex’s long history with producing chronographs, the Daytona has grown to mythic proportions, just like the race track and race drivers who win the pole position. In addition to being Rolex’s signature chronograph collection, the Cosmograph Daytona is, in fact, the world’s most famous chronograph watch. It is without a doubt the chronograph to which other luxury chronographs compare themselves to. Launched in the 1960s, let’s get a closer look at the three-part evolution of the Rolex Daytona series. Although Rolex already had several chronograph watches to its name, in 1963 the brand presented a new version dubbed the Cosmograph ref. 6239. With its new tachymeter engraved bezel and contrasting colors of the registers on the dial, this was the start of the Cosmograph’s journey. One year after its debut, the “Daytona” label joined the “Cosmograph” name. This was in honor of Rolex’s sponsorship of the famous endurance auto race in Florida. The Rolex Daytona designation eventually became a permanent part of the Cosmograph and today, the Rolex chronograph is simply known as the Daytona. The first series of the Rolex Daytona watches were made from the 1960s until the late 1980s. They carry four-digit reference numbers, such as the ref. 6240, ref. 6241, ref. 6262, ref. 6264, ref. 6263, ref. 6265, ref. 6269, and ref. 6270 Along with their distinct look, another noteworthy component of these vintage Daytona references are the engines under the hoods, so to speak. Powered by a movement based on the Valjoux Caliber 72, the early Rolex Daytona models were manual-winding ones. While four-digit Daytona references are the most popular vintage sports watches today, during its time, these manual chronographs were a hard sell. We can’t very well speak of the evolution of the Rolex Daytona without mentioning its most famous editions—the Paul Newman Daytona watches. 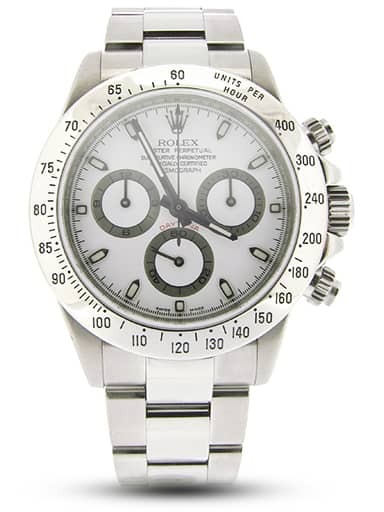 These particular Rolex Daytona series come equipped with a dial initially named the “exotic dial” by Rolex. These were later more commonly known as the Paul Newman dial thanks to the famous actor owning one of these special-edition Daytona watches. Finally, in 1988, Rolex presented a completely revamped version of the Daytona with the ref. 16520. The five-digit Daytona reference hailed a new era with an automatic Rolex Daytona. This time, replacing the manual movement was the automatic Rolex Caliber 4030. The Caliber 4030 is based on the Zenith El Primero movement. However, it boasts many Rolex modifications such as a new escapement, a reduction in the beats per hour rate, and the removal of the date function. 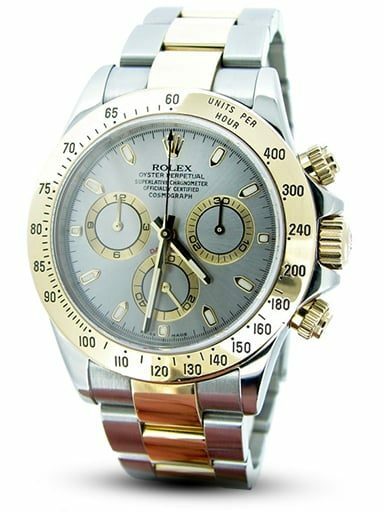 From the late 1980s until the start of the new millennium, Rolex produced a variety of automatic Daytona watches including steel, yellow gold, and two-tone versions. At the turn of this century, Rolex unveiled their first Daytona chronographs driven by an in-house automatic movement—Caliber 4130. The first editions of the 4130-powered Daytona models were the stainless steel ref. 116520, the yellow gold ref. 116518, the white gold ref. 116519, and the two-tone ref. 116523. Today, the most current versions of the Daytona still run on the famous Rolex Caliber 4130 movement, including the platinum anniversary model ref. 116506 and the newest stainless steel model with the ceramic bezel, Daytona ref. 116500LN, which came out in 2016. It’s impressive to think that although the Daytona had a slow start over five decades ago, today it enjoys its status as the leading luxury chronograph to own. It’s a Rolex story that will undoubtedly continue to write its own history for many more decades to come.